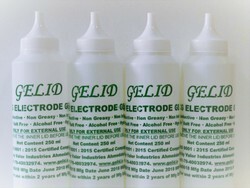 Providing you the best range of ecg gel - 250 ml with effective & timely delivery. ECG (Electrocardiography) gel acts as a coupling between electrodes and the skin to aid transmission of electro activity. This gel can be used with all electrocardiography equipment. ECG gel is also becoming more commonly used with sports heart rate monitoring equipment to improve the quality of the signal transmitted to the recording device. A high quality conductive gel. We are engaged in offering Ultrasound Gels of the premium quality. Our manufactured gels are widely applicable in hospitals and medical laboratories during ultrasound of internal organs of human bodies. Our made gels are formulated using hypoallergenic substances, these gels are appreciated by the clients for 100% safe and eco friendly features. We offer ECG, ultrasound jelly in different packing. Looking for Transmission Gel ?